It is in situations like this that one’s faith in humanity is restored. Regardless of how much demonizing goes on, regardless of how many times one reads that the other is evil, bloodthirsty and may be committed to terrorism, people’s compassion comes through at moments like this, and here it did not fail. 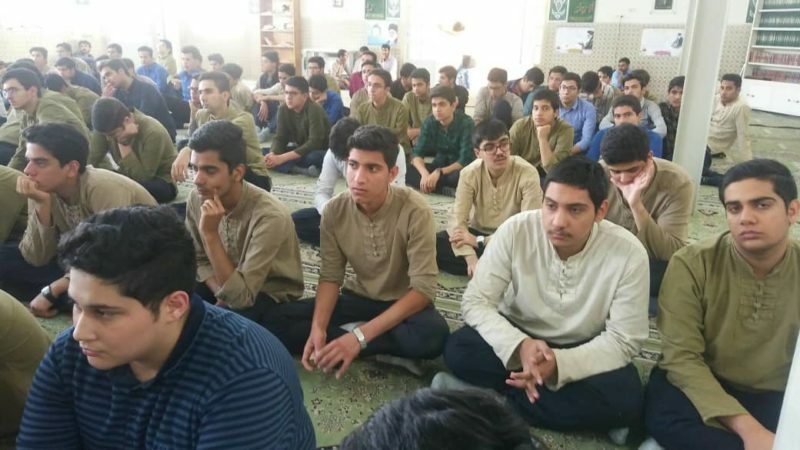 Iranian high school students. By Miko Peled. The look on people’s faces when I mention that I had just returned from visiting Iran is priceless. Even if the trip had been a terrible failure, it still would have been worth it just to see these expressions of confusion, disbelief and sometimes disdain at the mere mention of a visit to Iran. The trip was not a terrible failure; quite the opposite in fact. It was a reminder that looking at the U.S. from the outside, and in this case from a country that has all but been declared an enemy of the U.S., one has the advantage of a very different perspective; and America, led as it is by Donald Trump, seems petulant and dangerous and possessing far too much power. Naturally, wanting to hear first-hand what Iranians thought about current affairs played a big role in my decision to embark on this trip. It happened that it came about shortly after Trump’s declaration that the U.S. is pulling out of the Iran agreement and that sanctions were going to be reinstated. Though some people had suggested that I cancel the trip, I felt that this made the trip all the more important and interesting. The U.S. pulling out of the Nuclear Agreement and reinstating the sanctions will have a major effect on the country and its people, so hearing directly from the people who are affected by these policies was invaluable. Furthermore, since Iran is a Muslim country, I wanted to hear what Iranian people thought about the U.S. recognition of Jerusalem as the capital city of Israel. Once in Iran, the first impression I had was of calm and cleanliness all around. The edge, the smoking and intensity that one experiences in the Middle East and to a great degree in Europe were not present, or at least not evident; and one does not see billboards advertising cigarettes and certainly not alcohol. As for the Iranian people’s attitudes toward Iran’s predicament, no one I spoke to seemed particularly worried about the U.S. and Israel, and most people projected a calm confidence that was surprising and at the same time reassuring. Responses to the reinstatement of the sanctions and the warnings of an attack from Israel ranged from dismissive to confident that Iranians can handle whatever the future holds for them. Perhaps this is because, as Muslims, Iranians see these challenges as part of God’s confidence in them: as the passage from Surat El-Isra suggests, La yukallifu llahu nafsan illa wus‘aha – which loosely translated means, God only places upon us burdens we are capable of carrying. However, as one reads the recent list of demands placed on Iran by U.S. Secretary of State Mike Pompeo, it is clear that the U.S. is not interested in an agreement with Iran but rather wants to see total Iranian capitulation. The list includes demands that will turn Iran into a servant of Israel and the U.S.; it requires that Iran turn its back on its allies, like Hezbollah and Hamas, and relinquish its role in Syria and Yemen. Iranian support to groups that resist Israel and the U.S. is characterized by Pompeo as supporting terrorist groups. However, Hezbollah, which maintains resistance to Israel and secures Lebanon’s southern border from Israeli incursions, has just won a major political victory in the Lebanese general elections. Iran is also known to support Hamas, which also maintains resistance to the Israeli occupation and oppression in Palestine. In response to these demands, Iran’s Supreme Leader, Ayatollah Khamenei’s set conditions that would allow for the agreement to remain. These conditions were aimed mostly toward the European partners to the agreement, who say that they are committed to the deal — although large European companies, like French oil giant Total and the Danish shipping company Maersk, seem to be running like rats fleeing from a sinking ship, worried about harming their business connections with the U.S. Understandably, Iran is asking for assurances that the European partners to the agreement pull their weight and not let the U.S. destroy the Iranian economy. European powers should protect Iranian oil sales from the U.S. sanctions and continue buying Iranian crude. As U.S.-controlled banks are likely to jeopardize any trade with Iran, European banks should safeguard trade with Iran. Besides these, Iran is asking that France, Germany and the U.K. avoid asking for a new agreement on Iran’s ballistic missile programme or its regional activities, such as its presence in Yemen, Iraq and Syria. Unlike the drama one sees in the media, responses in Iran to the international saga unfolding are mostly calm: “We have been there before and we survived, we shall survive again.” Iranians are confident in their military and, in the event of an Israeli attack, they feel they will be able to defend themselves. More than anything, the U.S. pulling out of the agreement is seen as a test for the Europeans. Will the European countries show backbone and stand up to the U.S., or will they cower? Iran, having withstood the test of time, will withstand this too.